A part of every DBA’s job is to justify all those disk space requests. The phrases “I just need it” or “Trust me this database is going to grow one terabyte this year” might not convince your boss. We’re in the times of SANs, iSCSI, SAS drives, SSD drives and RAID architecture! You should be forking out almost the cost of your server in disk space. Unless of course losing data is an option where you work. Now that I’ve bored you or intrigued you (or something in between) I can get to my point. 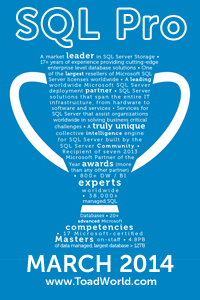 There is a wonderful tool that comes with SQL Server 2008 and later called the Management Data Warehouse (MDW) also known as the Data Collector. Now if you don’t have Data collection setup already you can follow the instructions written by SQL Server MVP Kalen Delaney at the link below. Note: Disk Usage is one of the default collection sets that will be initialized, do not turn it off. 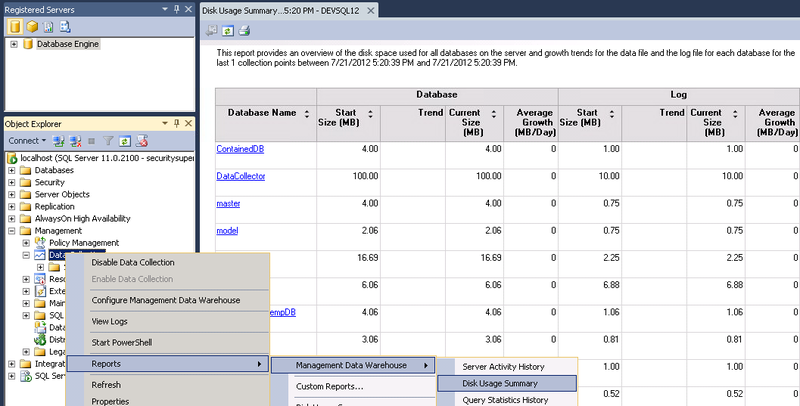 After you have completed the steps to setup data collection open up the Disk Usage report (see screen shot below). You should get a report that looks similar to the one in the background of the screen shot. Notice anything particularly annoying about the report? Here is a hint, you can’t change the start and end date! By the way there are tons of customized reports created to go against the MDW that you can download. I downloaded a few and was very frustrated trying to get them to work; not sure why since I’m very comfortable with SSRS but there were some issues with the data source. Anyhow, I created my own report and I wanted to share the query here with you all. This idea initially came up in a meeting where we asked for most space and was asked to prove it through numbers. So I turned on the MDW and started recording disk space and almost a year later I put together a quick dashboard report in both excel and Reporting Services to query the MDW directly. **Note: I called my Data collection database DataCollector. If yours is different, then you will have to change the code below and replace DataCollector with your Database name. /*The column DBSize stores the number of pages in the Database.Each page is equal to 8 KiloBytes. Therefore 128 Pages are equal to one MegaByte.Use these conversions to get the DBSize in the measurement you want. /*This query shows the most current size for each database and its logs including the last collection time. Thanks! I’m trying to figure how to make the query work for a consolidated MDW (where databases are not in sys.databases on the MDW server). Maybe not elegant, but I dumped table names from source instance into a utility database I could join on with your query instead of sys.databases and it works for what I needed. Cool! I put together some “non-elegant” code for bringing in login information from various servers into one server. Maybe you can try something similar to consolidate your MDW information.